Curriculum Design: X marks the spot? 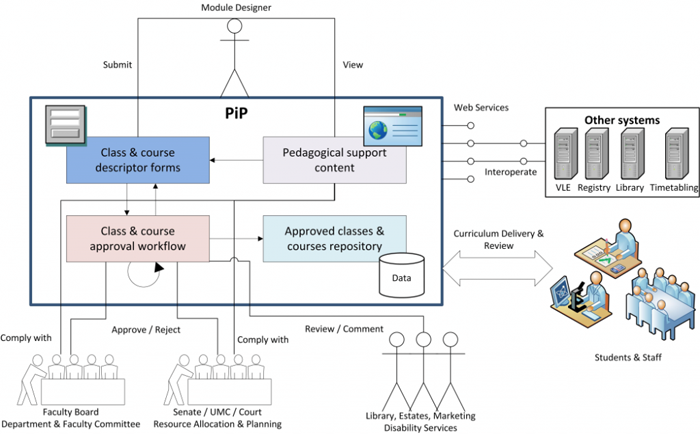 In her second post on Curriculum Design Lou McGill considers how institutions connect and manage course information, and the role that XCRI can play. 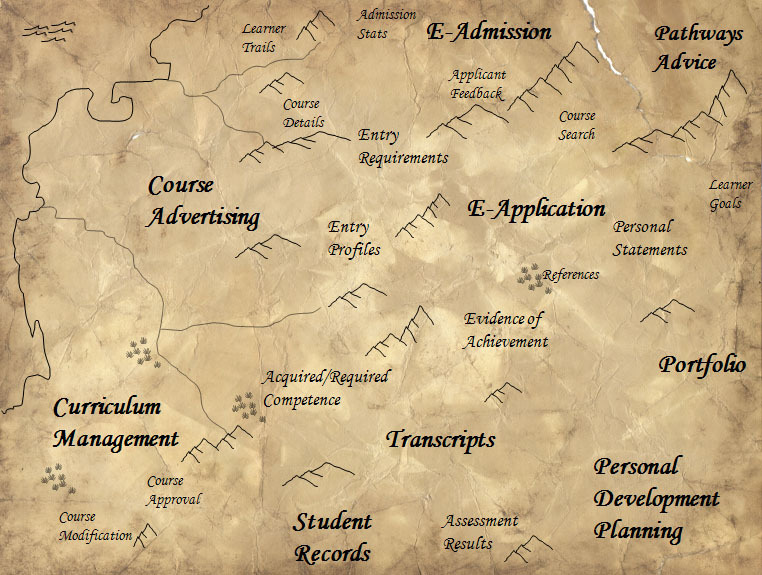 This ‘middle earth’ style map produced by Professor Mark Stubbs, Managed Learning Environment Project Director at the Manchester Metropolitan University (MMU) shows the extent of information about courses that exist in further and higher education institutions. What is missing on the map, and sometimes within institutions, are the paths which connect the breadth of processes and systems that link up this data. It would certainly make for a more complex picture but this is actually what many of the Institutional approaches to Curriculum Design projects are doing through business process mapping and through their baselining and early stakeholder engagement activities. The previous post introduced some of the approaches adopted by projects to map their processes. This post offers a bit more detail of the ways they managed their information and made sure that systems share and utilise this effectively. Course information comprises a range of data from several fundamental processes including course creation, approval, validation, documentation, QA, resource management (timetabling, resource allocation), modification and review. It seems rather obvious to say that the management of this information presents many challenges but feedback from the projects has seen common use of terminology such as ‘grappling’ and ‘wrestling’ to describe their efforts to prevent duplication and disconnected silos of data. Projects also highlighted a need for different views and pathways into course information for different stakeholders. However, course information does not exist in isolation and projects really benefitted from taking a broad view of the whole institutional landscape and thinking about how the different processes and data across other functions connect. 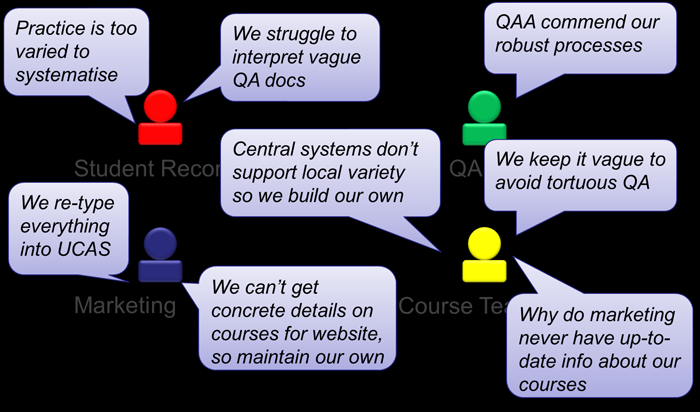 This rich picture emerging through conversations with several projects nicely highlights the need for joined-up thinking across organizational boundaries between Student Records, Quality Assurance, Marketing and Course Teams. Course approval, as an example, is a key activity in curriculum design and during baselining activities several projects identified challenges with existing processes as they involved formal (with a strong emphasis on QA) and well established paper-based methods. The format of this activity shaped the kinds of information collected and resulted in the need for augmentation and modification at later stages when inputting the data into different systems. Projects highlighted that many staff responded to the process as a ‘form-filling’ exercise rather than an opportunity to think about and re-consider their practice. At a practical level course related documents (such as handbooks, online module descriptions) were usually developed locally and quite separately to the course approval process. At a more strategic level, course-related information to support decision making and planning was often poorly collated and managed. How institutions utilise diverse course feedback information such as external examiners reports, evaluation data and broad market research is often subject to localised departmental approaches. The UG-Flex project team carried out a business process review for the University of Greenwich’s existing Programme Approval and Review process in order to identify stakeholders, issues and inform system requirements. The resulting documents are now informing ongoing system review at Greenwich. 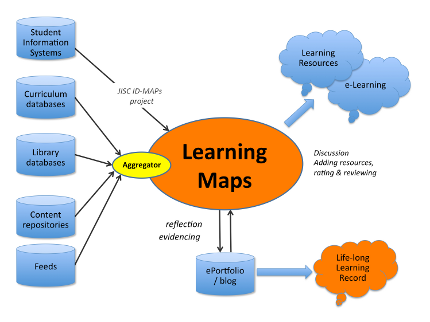 Other course process maps from other projects are included in the previous post and more will eventually be available on JISC Design Studio. Student data, which includes information about enrolment, admissions, registration, progression, assessment, records and e-portfolios, links to course information at several points and project activities have also included work in this area. A significant issue to emerge during the review process was that many existing institutional systems reflect the more traditional standard academic year course patterns. Departments which had adopted more flexible teaching approaches and models to respond to changing learner demands were frustrated by centralised systems that did not fit their needs and were using workarounds to fit their students in or developing parallel local systems. UG-Flex project stakeholders described cases where some students on short courses who had actually finished their course before gaining access to the VLE, which highlighted the need to organise their information differently to ensure timely access for different student cohorts. Claire Eustance, Project Manager at UG-Flex emphasises the need to establish and maintain trust when undertaking business process mapping to ensure that initial talks with staff are followed-up, with them being shown the outcomes and solutions to problems and keeping them involved throughout the process. UG-Flex’s efforts to reveal and map Greenwich’s institutional processes and how systems support these have helped strategic and operational managers recognise and articulate the need for change. UG-Flex aspires to see this approach to business process review and mapping embedded into mainstream strategic planning at Greenwich, anticipating long term benefits as systems and processes develop through cycles of change and review. Whilst this can appear to be about efficiencies such as reducing the administrative burden, duplication and clerical error, the crux is the real value that comes from being able to enhance the experience for all students. One of the places that most learners connect with institutional systems is through the VLE, and whilst they may not be interested in the underlying processes and systems, their learning experience can be significantly affected by them. VLEs are just one of the systems that benefit from well managed course and student information. The PREDICT project at City University have been looking at how course information links to student data with a particular emphasis on the admissions process and through linking information about student module choices to the VLE. The new student registration system at City has led to improved quality of information and significant reduction in administrative time (from 3 hours to 10 minutes) with about 90% of students registering online before their courses started. The vision is that on day one a student at City University will log into the VLE and see their own space with appropriate course information, discussion areas and content, and ultimately assessment and grading information. This will be achieved through the use of middleware to establish automatic links between the VLE , the admissions system, course information systems, the student record system, the library, finance and identify management functions to facilitate the sharing of data. Quite apart from the cost efficiencies (saving £20K per year on printing postage and data entry) time is freed for staff to do other activities and the student experience at the very beginning of their relationship with the University is significantly enhanced. The way that information is now being made available across systems immediately is a vast improvement on the traditional data-dump scheduled transfer that those of us who have been around for a while are very familiar. With an imperative to reduce duplication and the drive to enhance the student experience it is also possible to personalise the student view of their modules through the creation of rules which link content within the VLE. So, for example, a student registered on one course may automatically have relevant content from a different course or module revealed. There are also plans to incorporate module information so that students can select elective modules online, requiring links with timetabling and resource planning information. This can be quite a drawn out process as their selections may depend on results due in several months time – hence a need to incorporate attainment data. This currently necessitates some backward data exchange as marks entered into the VLE need to be seen by the student records system. Like other projects the activities of the PREDICT team have resulted in revised documentation and data collection mechanisms. One example is their module and programme revision documents which are available on the project website. In the longer term the institution is also considering linking the VLE to the student application and enquiry processes and the potential of using university OERs to feed into broader marketing processes. Future plans also include addressing staff and research data. The pragmatic incremental approach taken by City has some merit making sure they achieved some quick wins and using those to push forward more challenging tasks. The student experience can be greatly enhanced by quite pragmatic approaches to incorporating information into VLEs and making them transparent to learners. Some of the projects in the sister programme Transforming Curriculum Delivery Through Technology saw significant enhancement through these kinds of approaches, such as course enrolment and payment, timetabling, attendance data and assignment handling. At the heart of these achievements is the need to create core sets of data that can be exposed in number of places… Perhaps the most significant example of this in relation to course information is XCRI. The value of XCRI as a standard to facilitate exchange of course related information is fairly obvious, but an imperative for implementing it on a wide scale in institutions has been lacking. However the HEFCE requirements for institutions to provide KIS (Key Information Sets) for all courses from September 2012 and to feed into the HEAR (Higher Education Achievement Report) recording student achievement have both provided strong drivers to encourage the implementation of XCRI. Excerpt from SRC case study. As part of our series of articles on the technical aspects of the e-Learning Programme over the next few weeks Lou McGill, e-learning consultant, will be focussing on the Institutional Approaches to Curriculum Design projects. Now three years in to the four year programme these twelve projects have been exploring the convoluted and sometimes opaque processes universities use to design, validate and deliver courses. In this first post Lou discovers just how useful modelling approaches have been to help projects clarify these curriculum processes. Projects taking part in the ongoing JISC funded Institutional approaches to Curriculum Design programme have become very familiar with the challenges of taking an institution-wide business process approach. How can you get academic staff who often see the course approval process as a ‘form-filling exercise’ to use it as an opportunity to re-imagine and re-think their curricula? How do you convince staff to see the bigger institution-wide picture and understand the links between the seemingly separate processes that support teaching and learning? How do you utilise technologies to take some of the burden of these processes away, leaving staff time to focus on more important activities? Projects have been responding to these challenges by looking at ways to effectively integrate institutional systems to prevent duplication and streamline processes, particularly in relation to learning and teaching technologies such as institutional VLEs (Virtual Learning Environment) or e-portfolio systems. They have had to articulate and demonstrate the added value that linking these systems brings to a range or different stakeholders. Their experiences in identifying which technologies and standards can meet institutional needs and, perhaps more importantly, which people in the institution have the knowledge to inform these decisions are of value to other institutions. Key to streamlining these processes and integrating systems is the need to identify which data is central and how institutions collate, share and manage that information. Like many Universities, project teams have also been grappling with the need to align curriculum design with external drivers such as employer needs, the widening participation agenda or practical things like UCAS or HERA requirements; institutional requirements for increased efficiency; and flexibility to respond to changing learner needs. Many institutional systems reflect a time when standard three year degrees where the norm. Modularisation of courses and increasing numbers of part-time, distance and work-based students has resulted in the need for more agile systems that can reflect changing learning patterns and the need for more flexible support mechanisms. For many projects the programme timing mirrored an institutional desire to review existing systems which provided an ideal opportunity to re-examine the processes affected by these systems. As a four year programme projects had time to do a comprehensive baseline review and to invest significant time in engaging stakeholders. Project baselining activities or benchmarking are of high value to any change process as they offer time to look at and record where an institution is at the start of the change process and to really examine existing practice, identify strengths and highlight weaknesses. Having to explain something you do to others in detail provides an opportunity for questioning of activities that seem obvious but can be based on historical or traditional approaches that are no longer relevant. When baselining is done across a programme of activities a picture of the sector begins to emerge and this one has highlighted issues relating to marketing, quality assurance and enhancement, understanding and responding to employer and learner needs and demands, issues around assessment and feedback and managing course information. These areas are discussed in more detail in a briefing paper produced in February 2011 and will, of course, be described in more detail in the final synthesis reports at the end of the programme. This series of blog posts will focus on issues around managing course information and how institutions link this to other data through a range of processes and systems. During the baselining stage many diagrams were developed to capture the various processes and data that result from these. One example is the process workflow diagram from the PIP project (Principles in Patterns) at the University of Strathclyde. It can be useful to see how other institutions visualise their activities and processes, even if they do tend to be context specific, but it is the process of developing the diagrams that has been of most significance to the institutions involved, such as this curriculum approval process mapping described by the PALET Project (Programme Approval Lean Electronic Toolset) from Cardiff university. The dialogue and learning to be had from identifying, recording and sharing how the various business processes link up has been noted by several projects. The SRC Project (Supporting Responsive Curricula) has produced an excellent case study detailing Manchester Metropolitan University’s stakeholder requirements for an Academic Database of programmes and units. This document describes the activities and includes examples of process diagrams. Engaging stakeholders through the use of rich pictures was a method adopted by the UG-Flex Project at the University of Greenwich – a diagramming technique developed to capture stakeholder views in a non-confrontational way. See this example – computer says no! 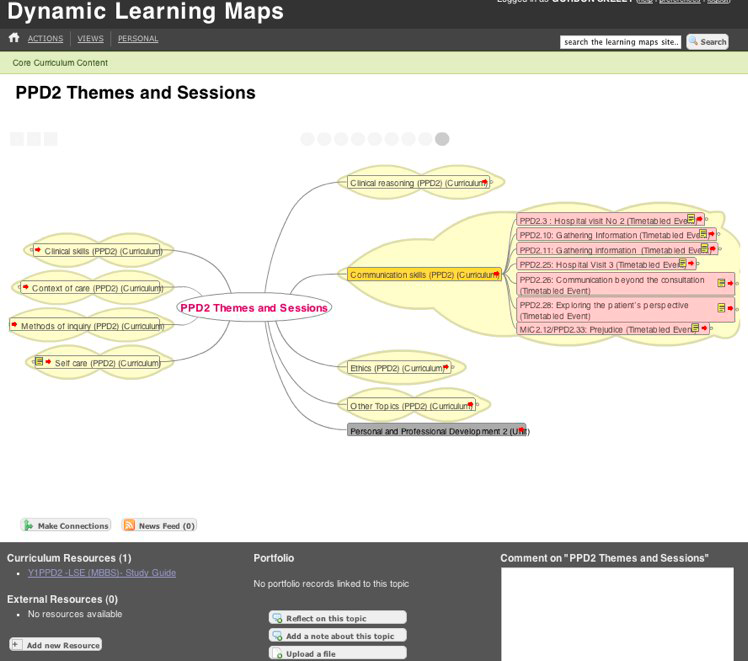 The SRC Project used ArchiMate components to present visualisations during baselining activities and have also blogged about this. They presented at the CETIS workshop on their experiences with ARchiMate which they decided to try after finding the Course Validation Reference Model (COVARM) useful but a bit complex for most stakeholders. The SRC project also used UML (Unifying Modelling Language) to develop more detailed diagrams and examples are available in the SRC case study. A range of project diagrams and process maps reflecting the different modelling approaches will be made available in the JISC Design Studio which is being added to as projects progress. The JISC CETIS Architecture and Modelling page provides an ongoing picture of developments in this area. It seems likely that these projects have significant potential to further our understanding of some key interoperability standards such as XCRI, learning design specifications, competency standards and qualification frameworks, particularly in relation to how these support data sharing across the range of institutional systems. Other Voices is the JISC CETIS guest blog. It gives us a chance to invite others to join the conversation and bring their perspective and expertise to our discussions. We may not always agree with everything guest bloggers write but we think they are worth listening to and consider it important to ensure they are part of the conversation.